This educational revue encompasses the rich history of the American Musical Theatre. Developed specifically by the Musical Theatre Guild for youth audiences, the piece spans the gamut from early shows such as Rose-Marie direct to the groundbreaking musicals of Show Boat and Oklahoma! and illustrates the sources, progression and development of the art form up through the present fare recently seen on Broadway (RENT, Ragtime, and The Lion King). In addition, the educational piece explains, with humor, the elements that make up a musical and tracks the development of the genre with the significant historical events of each decade. The cast includes four actor/singers and is performed with live piano and is currently part of the prestigious Music Center on Tour roster. 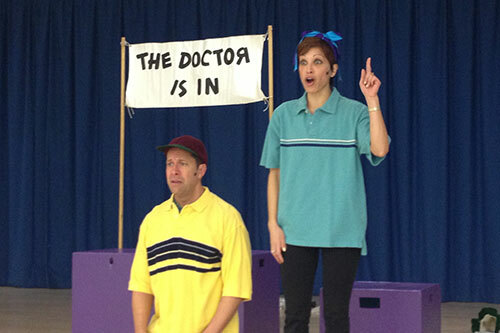 The show has also been presented for various adult and family audiences including performances at the Norris Theatre in Palos Verdes, CA, the Santa Fe Springs (CA) Public Library, the Los Angeles Migrant Educational Program and for the International Convention of Delta Kappa Gamma Society International.